This deck is built around two cards, both of which aren’t quite strong enough on their own but which synergize amazingly. The plan is simple: Play out your minions and progress Mechaz0r build. 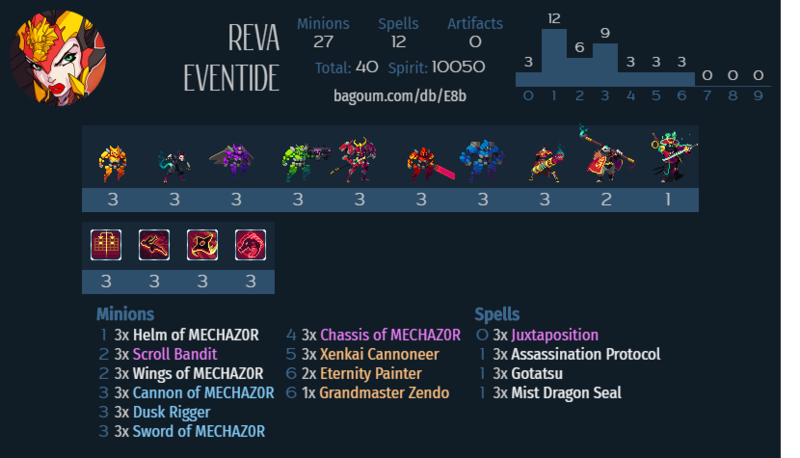 The OG mechs are relatively understatted for their costs, but you can avoid falling too far behind on board with the help of Songhai’s positioning tools (Juxtaposition and Mist Dragon Seal). Of course, these cheap spells also burn through your hand quickly, which is why the list includes Gotatsu as a cantrip and Scroll Bandit and Dusk Rigger as card advantage engines. Assassination Protocol is great at all points of the game to get immediate use out of a ranged, frenzy, or backstab minion. Try to hold a cheap mech (or a Mechaz0r Progression spell from Rigger) once you’re at 80% progress. Once you’re set up, it’s time for the combo: Cannoneer into surprise rush Mechaz0r right up in the enemy’s face. This should clear a large chunk of the enemy’s board, pushes face damage, and leaves you with multiple large threats. A 6/6 forcefield is pretty hard to deal with when you’re starting from a clear board, and usually ends the game pretty swiftly. The last couple of cards are meta tech choices: Eternity Painter clears (and dispels!) big things, while Zendo provides a way to close out games and get value from a dispelled Mechaz0r. Cool deck! Thanks for submitting a bunch of cool decks. I added you as a filter option under “Creator” on the main decks page.